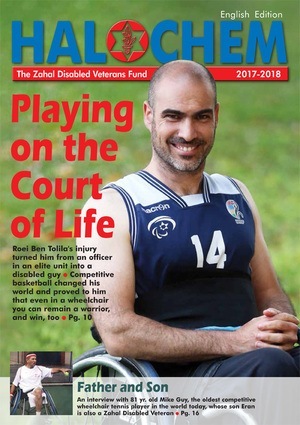 The Beit Halochem in Jerusalem opened in 1994, for the benefit of the members of the Zahal Disabled Veterans Organization living in the Jerusalem area. The center, located in the south-western part of Jerusalem, includes 10 acres of landscaped grounds, is situated between the new suburbs of Gilo, Malcha and Givat Masua, and offers a panoramic view of the Judean hills. The 6,750 sq. meters Jerusalem stone complex boasts a large multi-functional sports complex including a gymnasium, indoor swimming pool, and hydrotherapy and physiotherapy treatment and training rooms. In addition to these facilities, Beit Halochem Jerusalem has an auditorium, classrooms, a billiard hall, table tennis room and a shooting range. Over 3,500 disabled veterans are currently enrolled at Beit Halochem Jerusalem. Together with their families, this center serves some 9,000 people in the greater Jerusalem area.